When I read the letter to my husband, he replied in true engineer fashion, “Tell him the inverse square law applies here.” So helpful. The inverse square law states that “the intensity of an effect such as illumination or gravitational force changes in inverse proportion to the square of the distance from the source.” Loosely (very loosely) translated that means that as you get further and further from the source of the problem, its effect gets less and less. While the inverse square law works really well for some things like light and radio waves, it works less so with bees. Still, it’s worth taking a look at this neat little diagram I borrowed from Wikipedia. If S is the source (the hive), and each little red arrow represents a bee, you can see that as the you get further from the hive, the bees become further apart. Bees that are further apart will deposit less poop per unit of area. So in theory, at least, if the beekeeper moves the hives further away from his neighbor’s house, less bee poop should land on the neighbor’s windows. Unfortunately, unlike electromagnetic waves, bees have a mind of their own, and they do not radiate in perfectly straight beelines from a specific point and keep going forever. Nope. Bees have ideas, and ideas are antithetical to the laws of physics. Will more distance reduce bee poop? I can think of several reasons the inverse square law might come up short (or not) in this situation. Let’s take a look of some of the obvious ones. Bear in mind, they are all speculation on my part. Honey bees, I believe, are more apt to drop their load soon after leaving the hive. Carrying it any further than necessary would be energy wasteful, and biological systems do not waste energy. If this is the case, moving the hives further away might help a lot. Honey bees do not radiate evenly from the hive, but go in chosen directions. If a field is in bloom on the other side of the neighbor’s house, the bees may all go there at the same time. Thus, time of the year would play a big part in how much poop landed on the target windows. I learned in master beekeeping class that honey bees compensate for wind speed and direction while navigating. While I haven’t worked out the details, it looks like the wind could have a substantial effect on their flight path. Bees fly around objects. Obstacles in the bees’ path could hurt or help the homeowner, depending on where they are. If trees or buildings funnel the bees over the house, that is bad. If they funnel the bees away from the house, that would be good. Perhaps the homeowner could build a wall around his property. I understand there are people in government who could help. The inverse square law states that “the intensity of an effect such as illumination or gravitational force changes in inverse proportion to the square of the distance from the source.” This law applies to bee poop as well, with some exceptions. Because of the inverse square law, a little further away could make a big difference in the number of droppings. Also, I think most bees drop their load soon after they leave the hive, which should also help. But if the bees are traveling to a certain area, say a field or orchard, and they are passing over your place to get there, the decrease may not be as great as expected. So ultimately, it is impossible to answer your question. I would recommend that you encourage the beekeeper to move his hives and see if that works. I think there is a good chance it will help. Try to work it out with him because these situations can get messy if you decide to use the courts. If you are reasonable, he may be reasonable too. We hope. And hit him up for some honey when you talk to him. Even if you don’t like honey, it makes a great gift for your friends. So there you have it. A day in the life of a bee blogger. I never heard from him again, probably because he thinks I’m nuts. I noticed the most poop on my car which is not near my hives, but very close to a lot of great nectar bearing plants that are on the other side of the house from the hives. I can only assume that they fill up on nectar, swing wide, unload on the car, then head back to the hive (if they are even my bees). A lot of people would agree with you! He didn’t say. I wish I knew what happened and if the hives were moved. Ah, but perhaps your husband doesn’t know about the Mariko Aoki phenomenon! Despite the likelihood that the bees just poop within so many feet of the hive and will hit the car and the windows less if moved farther away, it is also possible (though admittedly not really very plausible) that it is the windows and the car that somehow CAUSE the poop bombs in those very spots……. Well, he doesn’t use that term for it, but that is his theory. He calls it target practice. That all sounds real reasonable. However, the bees in my backyard (on the south side) apparently like to poop on our cars on the other side of the house (the north side) which means they either hive to fly over the top of the house or around it one side or the other. My theory I is that they like to defecate on this side of the house because it is usually shady and barren of anything else they could be interested in. The driveway and street are on this side. Quite often while sitting at the table for lunch or supper we see outside our large north facing window, our sweet little bees flying lazily around often looking in the window at us likely wondering why they cannot get a little privacy while going to the bathroom. My bees favor the skylights. In spring, you can hardly notice any light coming in. What does bee poop look like? I’m going to keep an eye out. They look like sticky yellow splats. I love how scientific you are even about bee poop! By the way you have a sentence above starting ‘Bare in mind’, think you meant ‘Bear in mind’. Doesn’t really matter but thought you’d want to know. But it does matter! I hate things like that. Thanks. Love this post and the sarcasm. Thanks so much for these. They brighten the day. 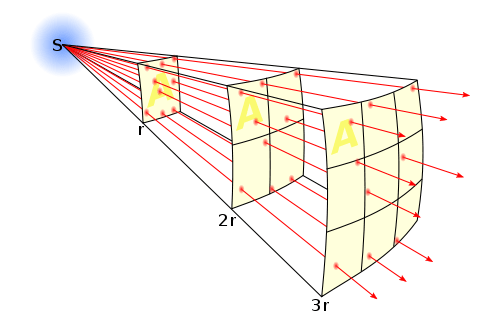 The inverse square law isn’t appropriate here because the bees effectively travel in two dimensions, the inverse square law is appropriate where dispersion occurs in three dimensions. So, the density of droppings should reduce in inverse proportion to distance (rather than to the square of distance). That is still a reduction. Actually, I think your first speculation is ‘spot on’ – I doubt if bees poop much after the first hundred yards or so after leaving the hive. A pity you left out your bravest quote into the ultimate advice to this homeowner who also “…..could build a wall around his property. I understand there are people in government who could help.”………… l0l…….. I don’t know the details, Sharon. Just reporting what a little (undocumented) worker bee told me. Well, I think you’re nuts too. I find most beekeepers are in one way or another. It would be interesting to know if there are trees or other forage on the opposite side of the car or house. If so, then moving the car could have a big impact as well. What would really be interesting, and I’m sure your husband would agree, is to stake one-foot square white capture boards around the hive. You could place them a varying distances and angles and record the bee poop per square in each area. This would allow you to derive a model of how much poop falls at the different angles and distances from the hive, perhaps even measure at different times of the year. Ultimately you could verify whether the inverse square law really applies here, and would make a great follow-on post. I’m sure you could get a grant to run the experiment. Then in subsequent years you could look at the effect of wind and obstacles around the hive. What fun! Sounds like a master beekeeper paper to me! You might also be able to tell the speed of the bees as they defecate by examining (and charting) the roundness of the deposit. (Although wind may affect this, so add a wind-o-meter to each board.) Examining the deposit shape would also produce data on direction while emitting the deposit. The more data you can generate the greater the need for additional grant dollars! You are onto something. Have you seen those blood spatter charts? Investigators can tell all kinds of things about weapons, distance, and angles of attack by analyzing the shape and distribution of blood drops. You and Erik could apply similar technology to see which bees are doing what. How does the offended homeowner KNOW that it is, in fact, bee poop? Has he had it analyzed? I have quite a few wild bees, bumblebees and other beneficial ‘bees’ in my yard and the only ‘poop’ I see is from flies that gather around my dog’s poop bucket where they gather in hope of finding a place to raise their maggots. Bagged and placed in a locking lid bucket renders their hope is indeed in vain… And what’s wrong with being nuts? The world is made spicier and so much more fun with a few of us nutters about. But why not call it bee-wee?! You are the funny one. This is a legitimate concern for urban or suburban beekeepers. Bees pooping all over a neighbor’s shiny Corvette or the clothes on another neighbor’s clothesline is all it takes to shut down your beekeeping. It doesn’t occur to most new beekeepers. Bees aren’t massless unlike photons, so instead of the inverse square law they should fall off exponentially like Yukawa’s potential. IOW moving the hives should help. Nobody else asked what a landowner in such close proximity to other dwellings is doing with FIFTEEN hives? My farm is 100 acres, surrounded by farms of 85, 140 and 160 acres. I was told that more than four hives in one such area would not make any more honey in total than the four would, and therefore some or all would not be able to survive. “Bees have ideas, and ideas are antithetical to the laws of physics.” Brilliant! I’m going to try and use that sentence somehow this week. When bees forage they leave a pheromone trail in the air for other bees to follow, and to help find their way back to the hive. Since following bees also leave a trail you end up with a well defined flight path. I’d suggest that moving the hive won’t help if the bees are trained to a specific path. When we installed a hive on our land we used large wooden panels to encourage the bees to take a desired flight path across our land before dispersing to forage. After a week or so we took the panels away. The bees still take the original path. The inverse square law still applies but in our case we’ve applied a predefined vector. Objects under the flight path are still redecorated occasionally but we know not to leave anything important there. Bees communicate the location of food sources via the waggle and round dances which are in turn influenced by the angle of the sun, the quality of the food source, and the distance from the hive. A pheromone trail in the air would dissipate in a matter of moments, and certainly would not be around the next morning. A good book or two on honey bee biology will help you with these concepts. What do they wipe with? I suspect that like (most? all?) birds, bees are incontinent. As soon as they have waste (be it liquid, slurry or solid), it is vacated. Not so! Honey bees can hold their waste for weeks, or even months, which is what they do in winter in cold climates. Only sick bees (those with Nosema or honey bee dysentery) defecate in the hive. Okay. Does this carry over to other social insects? But evolution to support flight would (might?) tend to suggest incontinence, so there must be some reason bees can hold onto waste. I live in one of those places that gets colder, but peak of summer now. Today happens to be cool and wet. And I happened to see another pollinator (only the second time I have seen one here), a hummingbird. My farm is pretty much covered in ant colonies (black and red). None aggressive. I plan to set up some habitats for solitary bees, and get some blue orchard bees. I had a habitat at Grande Prairie (only 120km away, so similar climate) and I had holes form 1/8 to 3/8 inch in size, all pretty much being used by solitary bees of some kind. Then the grounds keepers threw away this piece of 8×8 full of holes (and a piece of cedar screwed onto the back). One ant colony insists on ranching aphids (on poplar I believe). You’re in WA state? I’m north of you on the other side of the Rockies (Dawson Creek, where the Alaska Highway begins). Sure, we can get to 50F in the winter (chinooks), but that can be at any time of the day or night, and the wind is usually strong. In hives where a bottom screen is employed, do bees vacate waste there? When you look at it that way, I suppose it is huge. Imagine an elephant. Most bee larvae defecate at the end of the fifth instar, right before the cocoon is spun. In honey bees, the feces is woven right into the cocoon so it doesn’t contaminate things. In mason bees and similar species, you can find it in the nesting tubes but the bees are protected by the cocoon. I’ve never heard of honey bees defecating through a screened bottom. Interesting idea. I wonder if they could be house trained! To have feces in their body for that long, I would think that bees must have some way to suppress bacterial growth inside their intestine. The following paper says that the microflora of a bee GIT is extremely simple. Nearly all the bacteria are of 1 of 8 related species. I don’t see where the paper gets into suppression of bacterial growth, and other hits at DuckDuck didn’t appear very close to topic. Everyone knows that girls don’t poop, or fart for that matter! So, taking this as gospel, we must conclude that it is either those dastardly drones, or space invaders. And, they must wipe with White Cloud. You can check your local ordinances, but if the bees are kept legally, there’s not much you can do. Have you discussed the problem with the beekeeper? Maybe he would be willing the hives further from you. As this post explains, a little extra distance could make a big difference. I try to talk with him about the problem, he told me if I don’t want bee poop on my boats, just move my boats. I was going to suggest charting triangulation methods based on wind direction and flight patterns, but Marian’s Nov 2016 post beat me to it. I know a lot more about engineering than bees at this point, but am hopefully on an upward trajectory. I’m enjoying your blog, your POV, and your husband’s input. And my husband appreciated your comment.